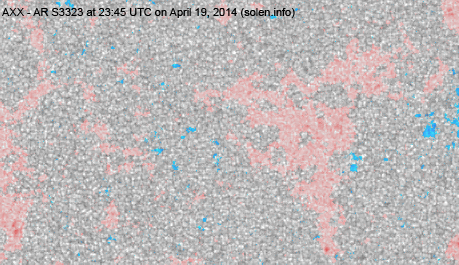 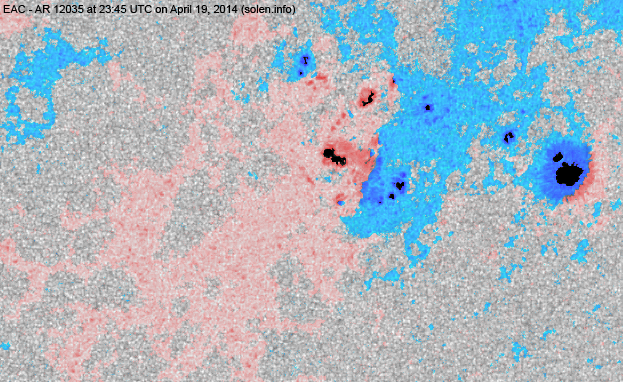 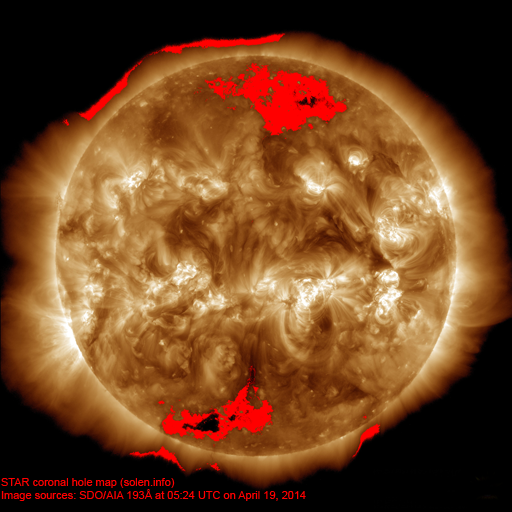 Last major update issued on April 21, 2014 at 06:50 UTC. 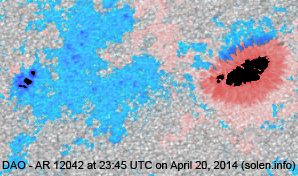 The geomagnetic field was quiet to minor storm on April 21. 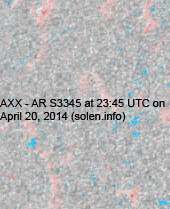 Solar wind speed at SOHO ranged between 524 and 968 km/s. 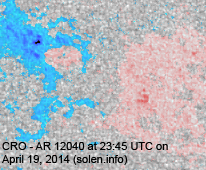 The CME associated with the M7 flare on April 18 was observed at SOHO at 10:46 UTC (solar wind increase, solar wind density increased at 10:20 UTC). 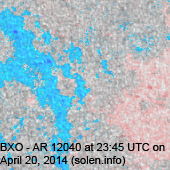 Solar flux at 20h UTC on 2.8 GHz was 162.5 (increasing 3.9 over the last solar rotation). 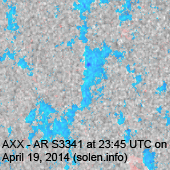 The 90 day 10.7 flux at 1 AU was 154.0. 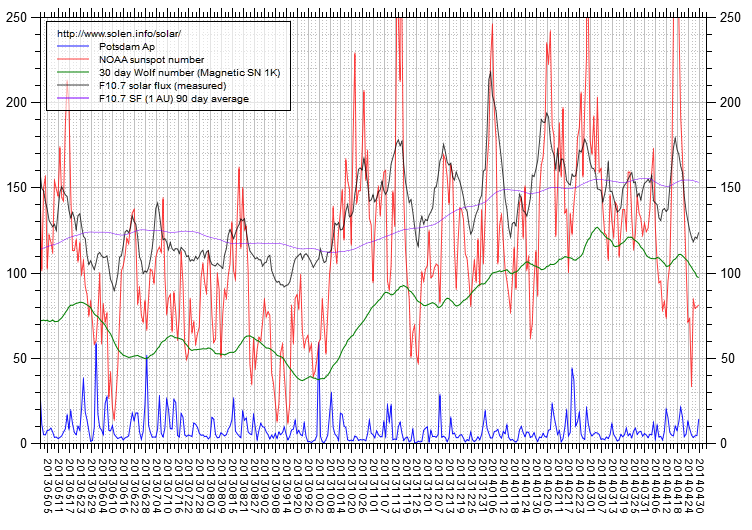 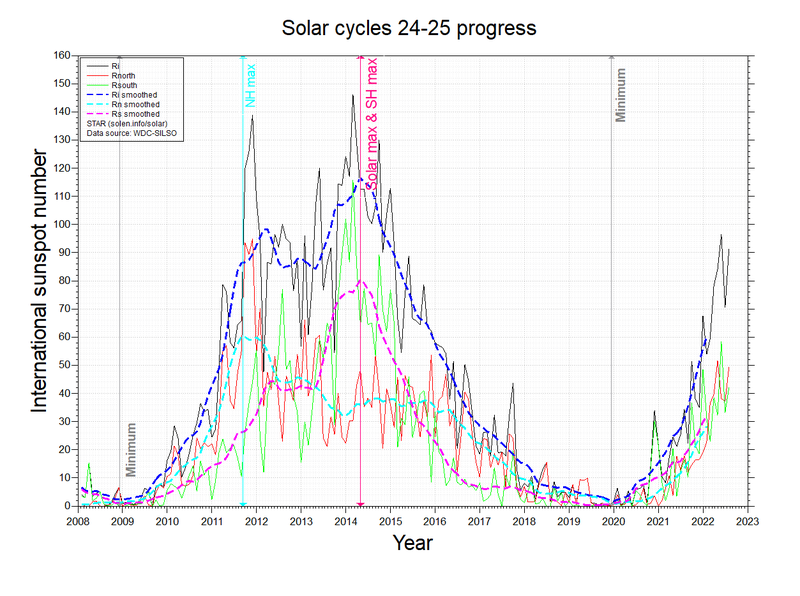 The Potsdam WDC planetary A index was 21 (STAR Ap - based on the mean of three hour interval ap indices: 20.9). 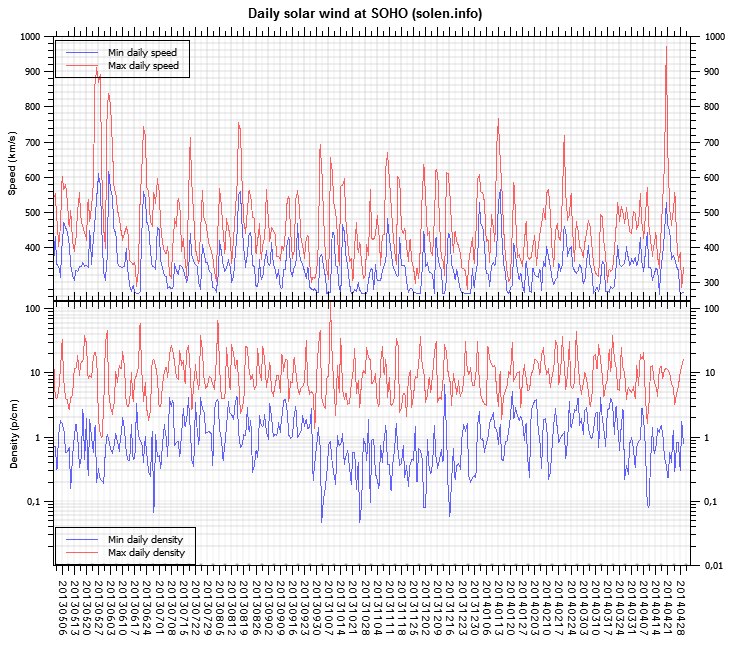 Three hour interval K indices: 32145444 (planetary), 32134434 (Boulder). 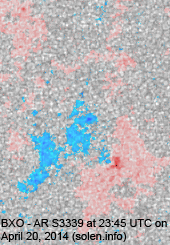 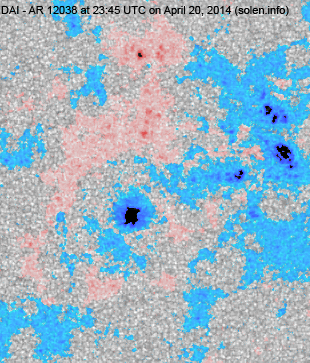 At the time of counting spots (see image time), spots were observed in 17 active regions in 2K resolution (SN: 380) and 17 active regions in 1K resolution (SN: 276) SDO images on the visible solar disk. 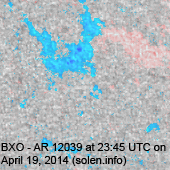 Region 12033 [N11W84] was mostly quiet and stable. 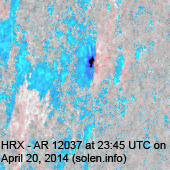 SWPC attributed the largest flare of the day to this region, however, the flare location appears to have been in AR 12032, just behind the northwest limb. 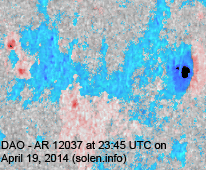 Region 12034 [N04W67] developed in the southwestern section and produced low level C flares. 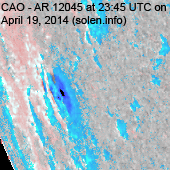 Region 12035 [S16W43] decayed slowly and was mostly quiet. 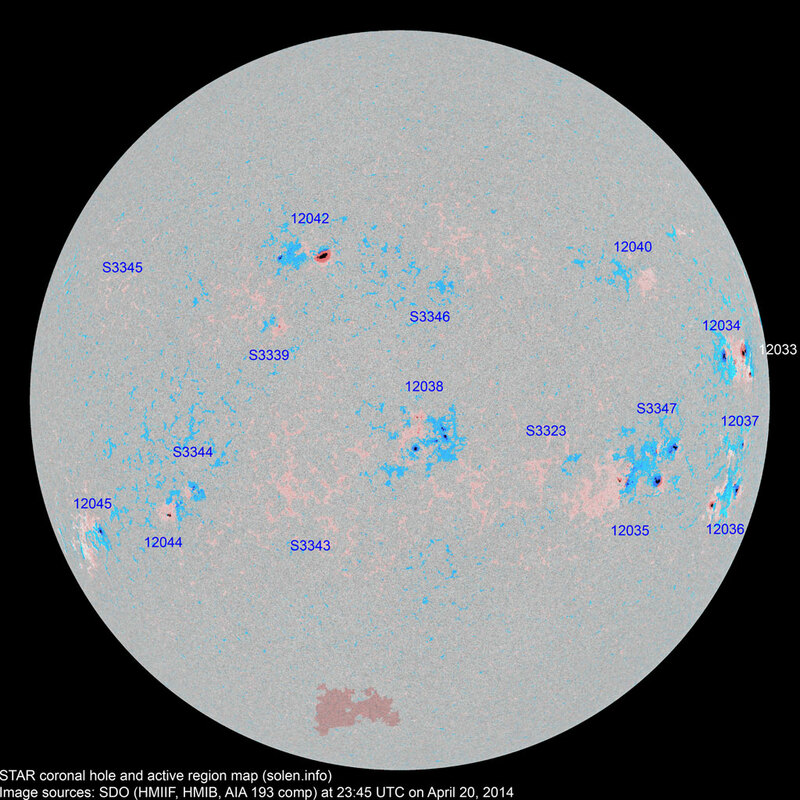 Region 12036 [S18W67] decayed, however, there is a weak magnetic delta structure in the leading spot section. 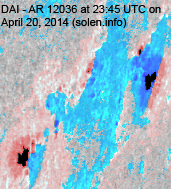 An M flare is possible. 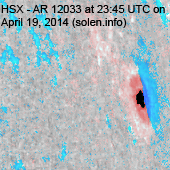 Region 12037 [S09W70] decayed slowly and lost the trailing spots. 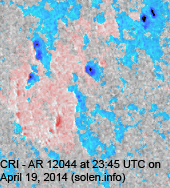 Region 12038 [S11W04] was quiet and stable. 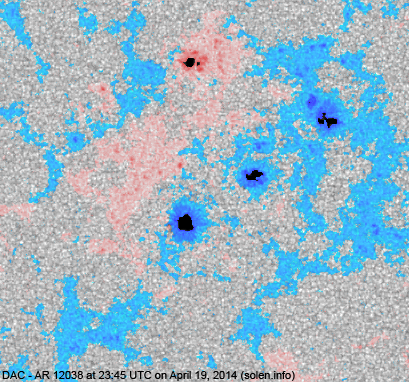 Region 12040 [N17W41] decayed and could soon become spotless. 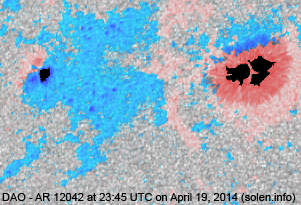 Region 12042 [N18E13] was quiet and stable. 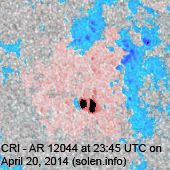 Region 12044 [S21E41] was quiet and stable. 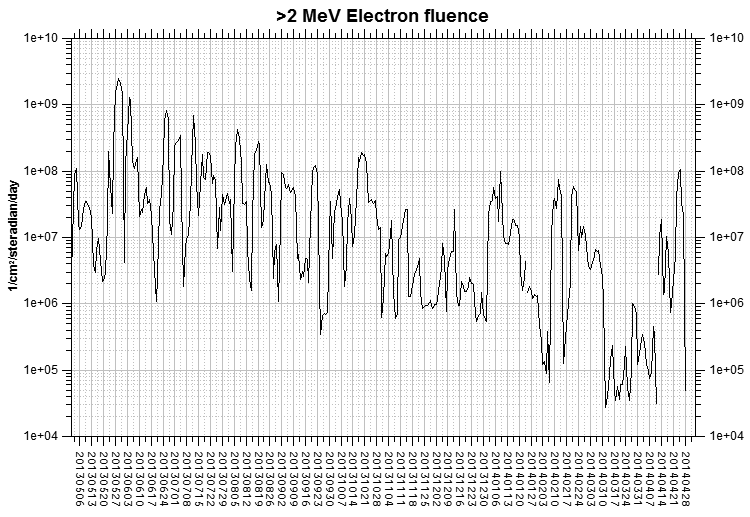 Region 12045 [S23E62] was quiet and stable. 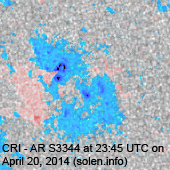 S3323 [S14W25] was mostly quiet and stable. 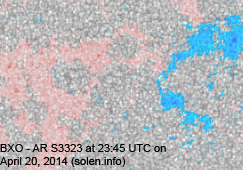 S3339 [N07E20] was quiet and stable. 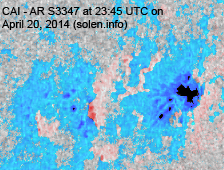 New region S3343 [S09E12] was observed with penumbra spots. 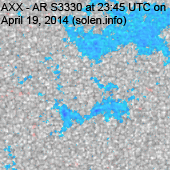 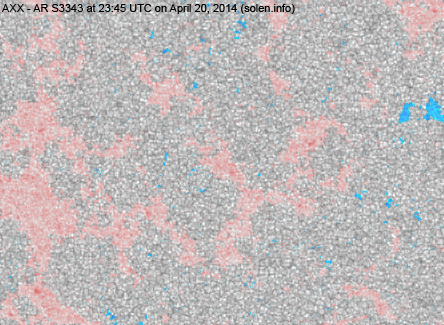 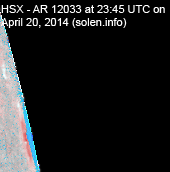 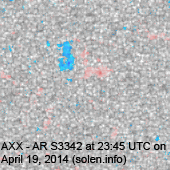 New region S3344 [S18E37] emerged to the northwest of AR 12044. 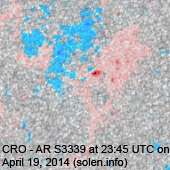 New region S3345 [N10E48] was observed with penumbra spots. 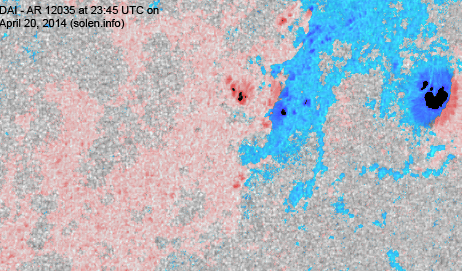 New region S3346 [N04W06] emerged with penumbra spots. 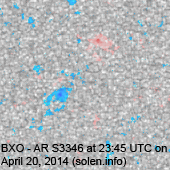 New region S3347 [S11W48] emerged quickly with several spots to the northwest of AR 12035. 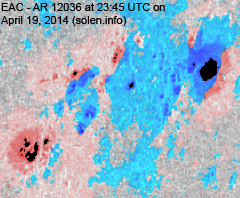 April 19-20: No obviously Earth directed CMEs were observed in LASCO and STEREO imagery. 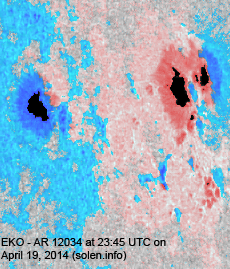 April 18: A filament eruption began just after 09h UTC to the south of AR 12036 and extended towards another center to the south of AR S3323 and appears to have been associated with a halo CME. 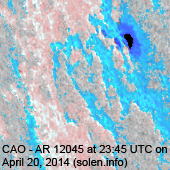 The M8 flare after noon in AR 12036 was associated with a full halo CME which reached Earth on April 20. The geomagnetic field is expected to be quiet to active on April 21 due to CME effects and quiet to unsettled on April 22 becoming quiet on April 23.